A marine has temporarily become an airman. 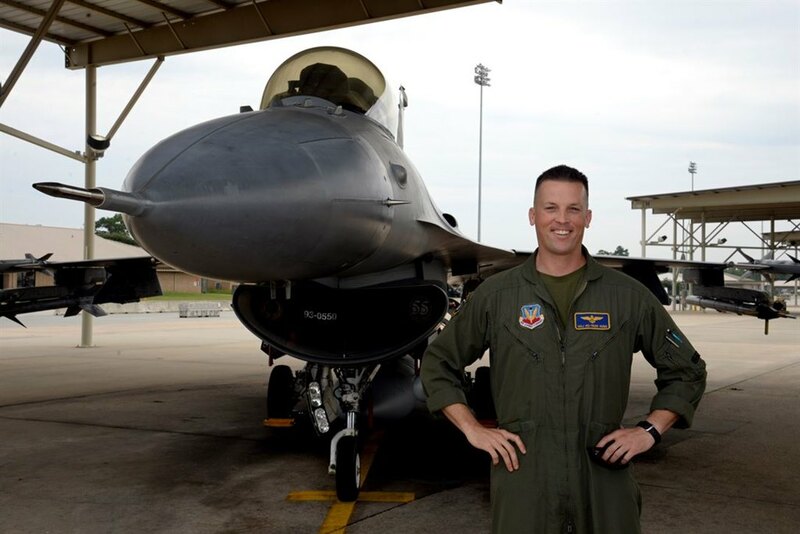 Marine Corps Maj. Eric Hugg, 55th Fighter Squadron chief of training, was part of an exchange program that gave Marine Corps pilots the opportunity to fly with the 55th Fighter Squadron based at Shaw Air Force Base. “I didn’t care [what aircraft I was assigned to fly],” Hugg said. “I wanted to fly fixed-wing jets, but I didn’t care what kind of jet at the time.” After the phase of pilot training the Marine Corps calls “Jet School,” he said, he decided that he wanted to fly the AV-8B Harrier II, a single-engine aircraft capable of vertical take-off and landing that has been operational in the Marine Corps since 1985. Once Hugg went out to the fleet, he was assigned to the 3rd Marine Air Wing, Marine Attack Squadron 311, at Marine Corps Air Station Yuma, Arizona. After Yuma, Hugg was a Harrier instructor pilot with the 2nd Marine Air Wing, Marine Attack Training Squadron 203, at Marine Corps Air Station Cherry Point, North Carolina, where he got the opportunity to apply for the exchange program to fly with the Air Force. A big part of the Harrier’s mission is air-to-ground combat, and 55th Fighter Squadron and 20th Fighter Wing train for air-to-ground. But the F-16CJ Fighting Falcon also participates in air-to-air combat, meaning that Hugg had to learn another style of fighting. Hugg dropped a bomb on all the expectations set for him, Neira said. With the F-16, tactics are the bread and butter of the airplane, Hugg said, while with the Harrier, basic flight skills are the staple. Despite the differences in service-specific language and minor difference between the ways the Air Force and Marine Corps do things, Hugg said, the professionalism, attention to detail and knowledge of craft that airmen exhibit is unbelievable. “I would feel comfortable flying into combat going all the way up to [Air Force Col. Stephen F. Jost, 20th Fighter Wing commander], and all the way down to the newest pilot in the squadron,” he said. Hugg flew with the 55th from 2014 to 2016 before returning to being a Marine. Hugg said he will recommend the exchange program -- which has been in place since the 1940s -- to the next generation of Marines. “I’ve never had a more exciting or fulfilling experience,” he added. Neira said Hugg’s ability as an F-16 pilot should be a comfort to any Air Force or Marine Corps pilot. “I’ve got complete faith in him as a wingman,” he said. Based on the story released by USAF 20th Fighter Wing.